Smallbores 210 grain 410 shotgun slugs are as accurate as they come. 5 shots to right and low are from 25 yards. Two shots in center are same distance after sight adjustment. We are receiving alot of traffic from our fellow small bore shooters in Australia, Greece, Africa and the UK. These are countries where .410 shotguns are used quite a bit. The biggest question of late is regarding the .41 210 grain slug load and its ability to fit through a .410 shotgun barrel. A .41 SWC will slide through a “Cylinder Bore” .410 shotgun with no resistance to speak of and come out the other end. Remember it must be a “cylinder bore” with NO choke! Any choke will likely be destroyed if you attempt to shoot a .41 semi wad cutter size slug and or a .41 pumpkin ball round. Yes! Though I question your saiga. Most likely NOT cylinder bore. You can use .40/10mm with the same recipe, all the same ingredients including powder, primer, etc., This would be safer. Start at 10 grains and work up from there. Does your Saiga 410 have the adjustable piston? Can you do a target test at 50 yards? Thanks. I am working on improving the accuracy of the 410 shotgun round as we speak. I am using 175 and 200 grain 410 slugs. It will be about two weeks before I can post anything as I am committed to other projects as well. off sandbags and 5 shots could be completely covered with a soda can. They are sweet. Hopefully my handloads will be good. Remember, the key to quality handloads is consistency of materials and “Bore” fit. You must always reproduce your rounds the same way and use good quality wads to “Seal” the bore – especially using the .40/10mm rounds for slugs. Awesome news Saigaman. I have not trierd the paraklese stuff yet. I hear it is accurate though. 168 grains is nothing to sneeze at either. The bear round will bve a little stiff with 200 grains and magnum powder. Red Dot is about as strong as I go and only to 10 grains. After that there is alot of overpressure warnings: popped primers, bulged cases, big booms and yes, I have blown up a Mossberg Bolt Action with 12 grains of Red Dot! Try a 195 grainer with Alliant 2400. Hollow points are tough because you really need the “Foster” type, weight forwardness to maintain stability and accuracy. Let me know how the Paraklese stuff is. I have a Saiga .410 and with a paradox rifled choke and 4X scope. I have worked up a slug load using the Sierra .41 magnum 210 grain hollow point. The reciept is basically following a load that is in the Ballistic Products “Coyote” manual. The “Coyote” load uses 3ea 0000 buckshot which also weight 210 grains and 20 grains of Hodgdon Li’l Gun powder. I use the BP BX410 wad, which is part of the “Coyote” load, with one cup cut off to form a flat surface for the bullet to set against. I use the BP thickest nitro card on top of the bullet and enough cards between the wad and bullet to get 0.300″ from the overshot card to the top of a 3″ magnum shell. Then the shell is rolled closed using the BP rolling tool. Only shot it from the standing position so far and the accuracy seems quite good out to a little less than 100 yards. My target was to have the muzzle energy of the AK47 7.62×39. To reach that ME, I’m using a little more powder than the “Coyote” load (23gr vs 20gr). There are no signs of overpressure on the shells. This round has substantially more kick and is much loader than any off-the-shelf ammo I have used. Haven’t got to the range yet to verify ballistics and grouping but things look good so far. That sounds like a kickin load! You will find that accuracy drops off with speed – but for self defense out to 25 yards you are doing well! Please forward a range report for me to post will ya’? Also, how is that choke working for you? The paradox choke seems to be doing its job based on initial accuracy indications. The Sierra .41 magnum is exactly .410″. I measured the barrel with a hole gauge and the breach end had a few thousands clearance to the round and the smooth bore muzzle end had about 0.004″ interference to the round. The groove diameter of the paradox choke is exactly the same as the diameter of the barrel muzzle end. It all works out nicely. I just got back from the range. Burned through about 250 rounds of .410 (220 .41 magnum slugs 30 buckshot). The scope was already dialed in fairly well, but spent a little time at 50 yards to make improvements. Went to 100 yards and had to make a lot of elevation adjustments, but started getting good groupings. Had a red dot on top of the scope that kept hitting me in the forehead. Took the red dot off and turned my attention to the steel silhouette target at 225 yards. Putting the forth elevation Mil Dot on the silhouette’s face was landing rounds at center mass. Had 10 round magazines and I started lobbing rounds on target. At first, I had a friend watching through binoculars. After a while, he stopped watching because I was hitting the silhouette on every shot, magazine after magazine. That was fun. Can hardly believe a 6” rifled choke could be that accurate at such a range. I was hoping to achieve accuracy on par with an AK47. But, as I understand, AK47s aren’t as accurate. Also hard to believe that a blunt nose hollow point could carry that far without anymore drop. Now I have AK47 muzzle energy with better accuracy and the versatility to go to shot shells; either way with 30 round drum magazines. Couldn’t be more tickled. I had loaded rounds with 3 ea 0000 buckshot which together weigh the same as the .41 magnum bullet. Loaded some with the Ballistics Products shot buffer for large shot and some without to make a comparison. The buffer material, as advertised, does make for a significantly tighter grouping. At about 23 paces, all shot fell into a 1 foot diameter circle. Think the gun will need cleaning now! Ready to load up some more for next time. Can you send us some pics of this choke set-up John – sounds like its something we can all benefit from! Not sure how to post photos. But,a photo of the 12ga paradox choke can be found at http://www.rusmilitary.com/html/guns_accessories.htm . This one seems to be only about 4 inches long. Haven’t seen the short version, as my 12ga and .410 paradox chokes are both 6 inches long. The paradox chokes screw onto the barrel threads like a muzzle brake. Saw some comments regarding concern of the .41 mag bullets fit in the .410. My gun is a smooth bore and the .41 mag starts with a few thousands clearance at the chamber and ends up with about 4 thousands interference at the muzzle, just before entering the paradox choke. The barrel squeezes the bullet down by 4 thousands, which fits it for entrance into the rifled choke. I’ve been using the Sierra jacketed bullets. They work very well, but supply has been intermittent. Recently bought a 1000 count of the X-Treme plated bullets from CJ Conevera. Haven’t tested them for accuracy and have concern that the very thin plate won’t withstand transitioning into the choke at speed. Will find out and make a post. Got both of my paradox chokes from a Russian named Alexey on eBay that primarily sells vacuum tube and motorcycle parts. Last time I checked, he didn’t have any paradox chokes. His eBay user ID is Urals. There is one aggravating problem with the Saiga .410 which has to do with loading magazines. In the bolt latched back position, the bolt is still over the magazine (unlike the S12) and when a loaded magazine is inserted , it presses the shells against the bolt. This in not a big deal if you use metallic shells, like the Russian have. However, plastic shells, as I’m using, get deformed by the pressure from the bolt and it makes cycling the bolt very difficult. I’m working on a redesigned bolt hold lever that will hold the bolt back to clear the magazine, as well as providing last round bolt hold open. Was having another problem with the .410 related to the gas system and the extra pressure from the hotter rounds. Shells were ejecting and flying out about 12 -14 feet. This doesn’t make you popular at the range and the bolt was being slammed back against the rear of the receiver. I already had one of the TAC-47 Autoplugs on my 12ga. So, I bought one for the .410. These are gas pressure regulators which have a spring that sets the maximum pressure in the system. Once you set it for your gun, you can put any round in the gun and, if it has sufficient pressure available, the gun cycles the same. However, the spring in the Autoplug was specific to the 12ga and way too stiff for the .410. Did some research and found an appropriate spring for the .410. Now, the gun cycles correctly with the hotter rounds. Also where would i get the 196grain slugs at? I make mine from a Lee Mold. I will send you a batch next week to test. 50 enough? I am so busy right now I cannot get to the range. Send me an address via my e-mail 410slugman@gmail.com. Appreciate the talks Bro. you sound as excited as I am about this! I have to get a few components to get the shells made and tested so it could be a lil while. If you are still willing to send them I’m up for it. 50 should be plenty. Nope, shipping is about $4 cause of weight. You can try them out and let me know the results. So I pay for shipping? When will they be sent out? I have been doing some research and a .410 with a cylinder choke can handle 328 grain slugs!!!!! They would go about 1100 FPS(feet per second). So they would be giving around 900 Foot lbs. of energy, giving it more power than a hot load 44 mag!!!. I think I may look into getting a mold for this. When I get the 196’s from you I will load them as soon as possible. Hope to hear from ya! Does anyone know where I can get a custom mold for this project? Hows the slugs been working for you? Slow…I started a new job and it has kept me from “Playing”. I am getting a new 410 shotgun and so I hope to continue in a week or so. Very good. Groups are tighter. And you? I stil havent had a chance to play around with the slugs you sent me. I still need to get a few supplies. How tight are the groups now? 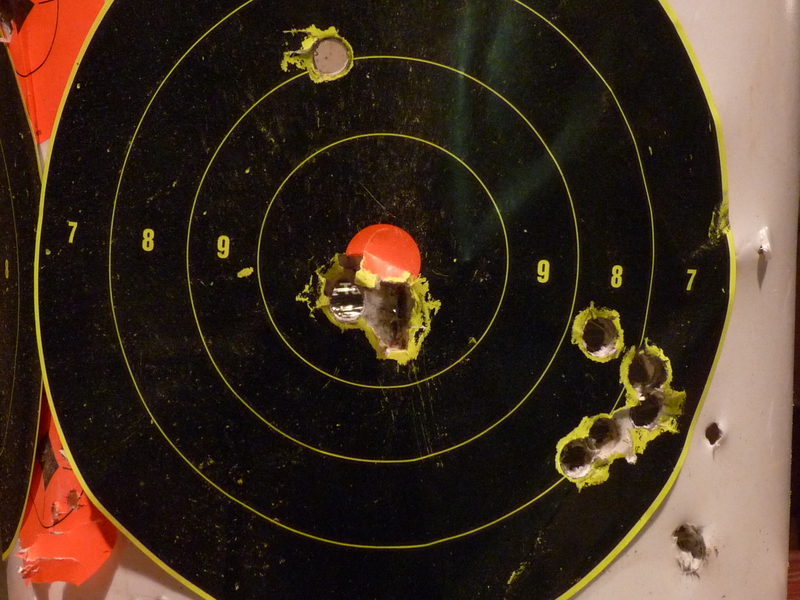 Have you shot longer distances….like 50 yards.